Mint growers already know that their plants can grow explosively, making pests out of themselves in places where they’re not welcome, but not all mint growers are aware of an even more obnoxious pest that feeds on these plants. When your well-behaved mint plants suddenly take a bad turn, wilt unexpectedly or seem unwell, mint plant borers may be to blame. Mint borers are the larval form of a light brown moth that hold their wings over themselves like a partially flattened tent. Adults reach up to 3/4 inch, emerging from mid-June through mid-August. During the week they’re alive, adults lay eggs aggressively on peppermint and spearmint leaves. Larvae emerge in about 10 days and begin feeding on leaves. After a few days, these hungry larvae drop into the soil to chew on root hairs and burrow into the rhizomes of their host plants. The serious mint root borer damage starts at this point and continues for up to three months before the larvae leave the roots to pupate. Mint plant borers are difficult to control because they spend most of their lives hiding inside the roots of plants most gardeners would rather keep alive. Mint root borer damage is subtle, further complicating things; signs like reduced yield, stunted growth and general weakness can be caused by a myriad of plant problems. 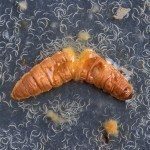 Beneficial nematodes may be used for mint root borer control, though repeated applications are usually necessary before you see noticeable improvement. Releasing parasitic nematodes at a rate of one to two billion juveniles per acre in late August to early September can help decrease the number of juveniles that make it to adulthood. Space applications a week apart to establish a healthy colony of nematodes and reapply new eggs the following fall to further shore up numbers. Chemicals like chlorantraniliprole, chlorpyrifos or ethoprop can be applied to beds where mint plant borers are a constant threat, but only chlorantraniliprole should be used during the growing season – you need only wait three days for a safe harvest. Chlorpyrifos requires 90 days between application and harvest, whereas ethoprop needs 225 days.